Posing little pooches with full-on celeb style. 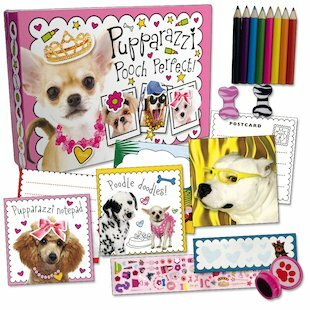 Stationery for dog-lovers who enjoy a touch of glamour. This kit is full of perfect puppies: the kind who like to ride in handbags and cuddle up in fluffy coats. And in keeping with its fashionable look, it’s packed with design tools. 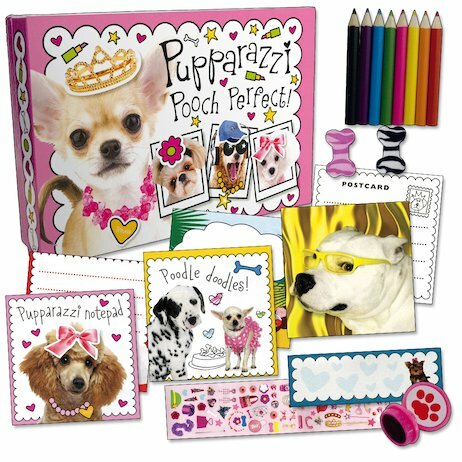 There’s a design pad, notepad, postcards, coloured pencils, stickers, a stamper, sticky notes and erasers. Hello, puppy delight!